You’re settling in to the team nicely now that you know the ropes. This week’s problems are from around the Department offices. If the letters concerned were sent only to Sweden, Brazil and Singapore, how many letters did the assistant send out? Leon is building one component of a new hands-on exhibit. He knows it will be composed of three identical solid blocks of wood, each A cm by 8 cm by 18 cm in size, where A is the answer to the Carambola Orchard problem from last week. These blocks will be glued together on their exteriors, in some geometric arrangement. The designer has not yet specified exactly how the blocks are to be glued, but Leon needs to order supplies right away. So, Leon buys just enough special high-durability paint to be sure he can cover the finished component regardless of how the blocks end up being glued together. Each milliliter of paint covers 96 square centimeters of wood surface. What is the largest number of milliliters of paint that Leon will have left over once the component is built and painted, assuming no paint is wasted? Carambola Orchard. Still waiting on that relay. Farm Roundup. Sometimes a problem gets easier if we add some things to it. In the accompanying diagram, we’ve added another identical buffer zone and some lines to the diagram, as well as some letters naming various regions of the field, so that it’s easier to talk and reason about the problem. 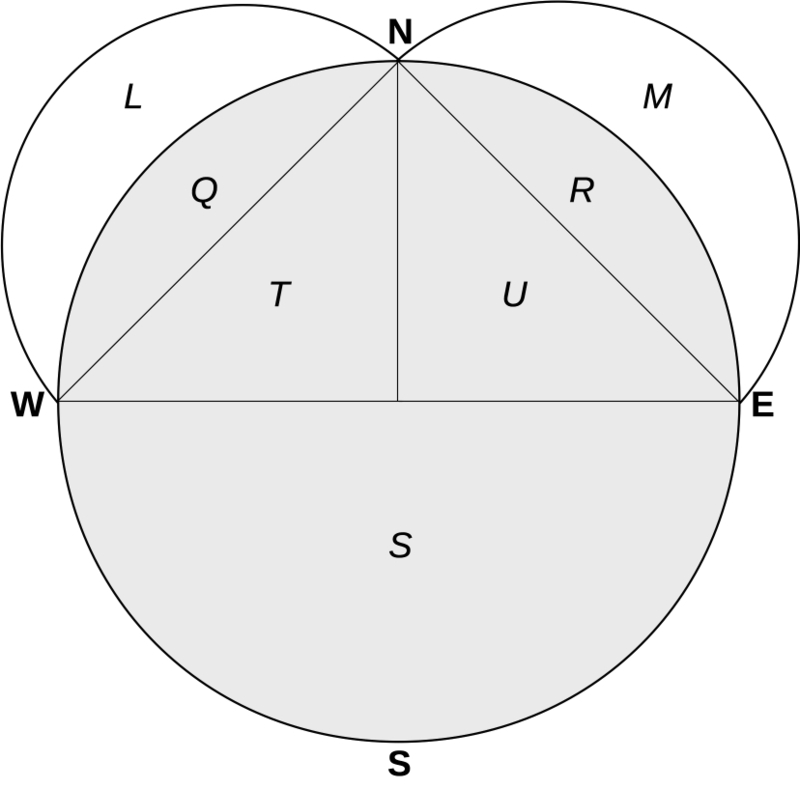 We want the area of region L. But notice that L and Q together form a semicircle (which we will call LQ for short) and R and M form an identical semicircle RM. Also, S is a similar semicircle, and so altogether we have three similar figures, in this case semicircles, erected on the two legs and the hypotenuse of the triangle TU, which is an isosceles right triangle. Therefore, by the Pythagorean Theorem, LQ + RM = S. But QTUR is another semicircle identical to S, so LQ + RM = QTUR. Now LQ is identical to RM, so each is half of this common area; and QTUR also splits into identical areas QT and UR, each half of the total. That means that each of these halves are equal, so LQ = QT. But now both of these decompose into their two subregions: L + Q = Q + T. Subtracting Q from both sides tells us that L = T. In other words, to calculate the area of the odd curvy region we want (L), all we have to do is calculate the area of triangle T, which is simple. It has height and base both equal to 400m, so its area is ½ x 400m x 400m = 80,000 sq m. So it takes exactly 80 bags of seed to cover the buffer zone L – no partial bags will be needed. Hey, to be in the game, y’ gotta know the history of the game! That funny shape L is called a “lune.” And a mathematician named Hippocrates made it the first shape with entirely curved boundary to have its area exactly computed, about 2500 years ago – using just about the same method you did! Find more puzzles at varsity.momath.org.